Emails obtained by the Washington Times seem to contradict the Obama administration’s claims that its loans to solar companies are apolitical. 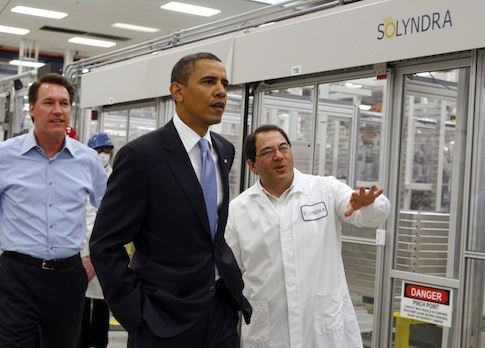 Executives at BrightSource, a solar energy company, touted the company’s political influence in obtaining a $1.6 billion loan guarantee from the Department of Energy—the same program exploited by the now-bankrupt Solyndra. "We have a lot of force gearing up to leaverage [sic] them now, including the WH and VP office [Sen. Harry] Reid and [Sen. Dianne] Feinstein, and Gov. [Jerry] Brown" of California, reads an early March 2011 email from Arthur Haubenstock, the company's vice president of regulatory affairs. Mr. Haubenstock goes on to question whether the company should push its administration contacts to immediately arrange a call between Energy Secretary Steven Chu and Interior Secretary Kenneth L. Salazar, a project proponent, or keep it in their back pocket "to blast through any last roadblock that may appear …"
Other emails from 2009 and the first 10 months of 2010 show apparent political calculations that BrightSource and affiliate companies hoped to use to their advantage. On Dec. 3, 2009, Bernard Toon—formerly Mr. Biden's chief of staff who later became a lobbyist for Bechtel Corp., a mammoth construction company and contractor for the Ivanpah project—lays out how the project could help two influential Democratic senators. "Calls are in to Biden's staff and I will be approaching the political affairs office at the White House tomorrow as well, as this project could benefit two senators who are in cycle and whose races will be tough next year—[Barbara] Boxer and the Majority Leader, Sen. Reid," he wrote in the message to BrightSource CEO John Woolard. Republicans have repeatedly hammered the Obama administration for a string of multibillion dollar loans written to failing companies headed by Obama donors and major Democratic players. In one of the most memorable moments of the first presidential debate, GOP nominee Mitt Romney criticized Obama over such loan programs saying, "you don’t just pick the winners and losers—you pick the losers." This entry was posted in Politics and tagged BrightSource Energy, Department of Energy, Green Energy, Obama Administration, Progressive Movement, Solyndra. Bookmark the permalink.